Saturday night I was out to dinner with some friends to celebrate Keri's birthday, when we start to discuss different ethnicities of food we enjoy. Everyone else: Strange look directed at me. Me: "Not Mimosa's, SA -mosa's! 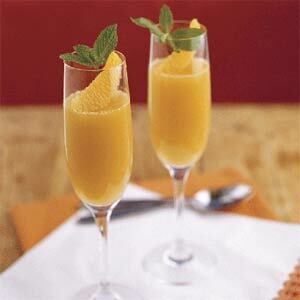 But non-alcoholic Mimosa's are really great too." Dennis: "Umm...isn't that just orange juice?" Me: "What? Really? I thought it was minty?" Keri: "Ohhh...you are thinking of Mojito's." Me: "Oops. I guess I need to drink more." See, I don't drink alcohol at all, but now I'm really excited to have virgin Mimosa's with breakfast every morning! Did you know they serve them at McDonald's even? High class! And while roadtripping I recently enjoyed a "virgin mimosa" from McDonald's... while driving even!